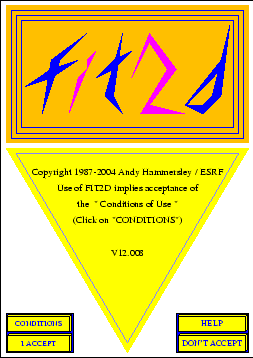 Use of FIT2D implies acceptance of the ``Conditions of Use'' (see Page ). This manual describes use of FIT2D, a 2-D data reduction and analysis program, specialising in model fitting amd detector distortion calibration and correction. FIT2D may be used off-line or as part of an on-line data acquisition system. FIT2D is a program which allows difficult data analysis problems to be tackled using 2-D dimensional fitting of user specified models. To enable model fitting to be performed on a wide variety of input data, many other more basic data analysis operations are also available. Calibration and correction of detector distortion has become an important part of FIT2D. FIT2D continues development, but already supports a wide range of basic data analysis operations and more sophisticated analysis methods. Normal graphics display methods are available. INTENDED AUDIENCE: This document is intended for scientists and engineers who intend to use FIT2D for basic data analysis, data visualisation, or data format conversion. This manual is intended for reference and most users should not need to read more than small sections of the manual. The index should be of use in finding information on specific subjects, and users are recommended to use the index extensively. The manual contains many cross-references so useful inter-relating sections should be easy to find. (If you have helpful suggestions for further index entries or cross-references please contact me.) For newcomers to FIT2D the user guide ``FIT2D: An Introduction and Overview'' is recommended as a starting point.